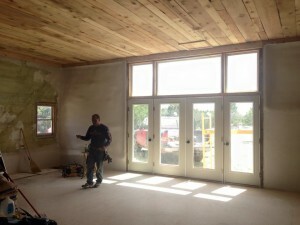 A month at Ravenrock focused on Barn construction has meant standing in the swirl of plaster dust, in piles of construction detritus, mousetraps, clutter, looking out the newly installed glass doors. My body expanding, growing into the ground. The Barn is no longer a farm building; it is a temple. A presence enveloping me. A grandeur, and a large timeless purpose. Path. People walk into the Barn and ask where’s the electricity and the toilet? The running water? I am not sure I need them, and until I do I won’t put them in. In many places I’ve lived, I have felt coerced by the assumptions of designers and engineers. As if I’ve been moved into worker bee housing. More than perfectly grouted tile, I need light, air. A garden. The Barn is a slow experiment in discovering need, starting with the least and moving on through experience rather than predetermining at the get go. I’m not yet free of this past year of death and loss and pain. I got through it. I discovered how capable I am, that I ‘had it in me’. Difficulty is a learning, yes, yes. Strenuous human lessons. I cherish the unknown gifts, unimaginable gifts. None of them easy. And tribulation certainly tested my practice. I wrung every drop of fortitude and focus, of present-ness and awakening, out of my bones to get through. All spiritual practitioners are better off for practicing breathing, and being in our bodies, and calming our anxiety, and not taking our self seriously, and not being reactive, and feeling gravity as home, breathing as time. Our efforts come in handy. But that is not the larger purpose. ‘Useful’ is about society not Path. I had begun to wonder if I would spend the remainder of my days dealing with the red tape rat race heaped on aging and end of life. Would I get back to my peaceful, subtle journey? In quietude, nature, off the electric hook? Can’t I just live and die in peace? Be useful has been dinned into us, as if this treacherous directive will vindicate our lives. How can we know in the largest, wisest overview what is useful? Nuclear power. Electricity. Pharmaceuticals. Great stuff but they don’t come with instructions on wise use. We are caught in the close view, hurtling from impulse to impulse, eating our desires into bigger desires and bigger disappointments. Wisdom always escapes us. Putting aside usefulness and relevance as a measure of our value is a stage of deepening in all spiritual traditions. Here I am in myself as well. Men ana? Ana huna. Who am I? I exist. A Sufi chant. Not: Who am I? I am so-and-so’s child, employee, teacher, student, parent, etc etc etc. What is most essential in us? Who are we in the wildernesses of non-relevance? I knew that helping my father die was useful but it felt like pure love. I never ever knew I was useful. Well, I knew I was helping. I knew I was needed, really needed, not just fake trivial need. I mean the kind of need where the person cannot bring the cup to their lips. I knew that I was kind but kindness just exploded out of my heart because I loved him. I never had a smarmy self-righteous sense of being generous. I was getting so much. Just raking it in. ‘Useful’ is a strange and twisting concept. Here comes the Twilight Zone question. What if you were the last person on Earth? Or the only survivor of a space mission floating throughout your remaining days in a capsule somewhere? No more leaning on the opinion of others. No one knows what you do or think. No one is there to care. No one will ever know of you. Piss on the floor? You only bother yourself. Set the immaculate table with no one but yourself to please. Now what will you do in this void? All traditions embrace this fundamental repositioning of self in the firmament of motivation. To become nothing. To jettison self importance, specialness, our imagined value. To become ordinary. To become less than an ant. To become sheer as wind, and as impermanent. To let go of making monuments to our self. To know we are dust. And all this is a gentle joy, because what do we have? The moment we are in. We will feel tenuous until we have forged a solid peace with such being-ness. In the Barn, in the crud, my purpose came back. Stop practicing my habitual worry—the sign of imagining myself to be superior. I worry therefor I try harder, do better, and so forth. It is a kind of simplicity, this removing of roccoco overthinking that muddles straight lines of perception and clean curves of motion. Find a way to be relaxed, let go of friction. Not being in the fray is one way to help myself and to help others who come to Movement Monastery. We can practice relaxation as we move, cook, sit and talk, sit and not talk, walk and talk or not talk…All this has nothing much to do with being useful. Helping others practice something like this is not being useful. It is simply a thing to work on. Who knows how it will purpose itself. A purpose without pretention to purpose.